On the occasion of Childers day in India have tried this kid recipe. This is my first pizza with plain flour and wheat flour. This pizza is light with just cheese, tomato, basil toppings on the thick base. Pizza base can be made completely using wheat flour (recipe link) and toppings can be customised. Combine honey, 3/4cup hot water, yeast in a bowl and let it stand for 5-10minutes/until frothy. Sieve wheat flour, plain flour, salt in a mixing bowl, make a well and pour in olive oil mix well, then pour in yeast mixture little at a time and mix until a soft and pliable dough is obtained (add in extra water if required). Turn the dough onto the lightly floured surface and knead for 3-5minutes until smooth. Transfer to the greased bowl and cover with a cling film/kitchen towel and set aside for 1-2hours. Mix tomato puree, basil, garlic together in a pan and cook on a medium low flame for 8-10minutes (stirring in between) , season with ground pepper, herbs, salt mix well and set aside. Pre-heat the oven at 220degc, grease the pizza tray with olive oil and dust some fine corn meal/plain flour and set aside. After the resting time punch down the dough and knead for 1-2minutes again by dusting some flour. Then divide the dough as desired. On a floured surface roll out the dough into rounds using rolling pin, roll it thin as it rises again. After 5 minutes pull out the base and spread the sauce over the bases with the back of spoon, scatter with cheese and tomatoes, drizzle with olive oil and bake again for 8-10minutes/ until the crust is golden. Once baked top with basil leaves and serve. I blanched tomatoes and peeled the skin and then blend to puree for tomato sauce. 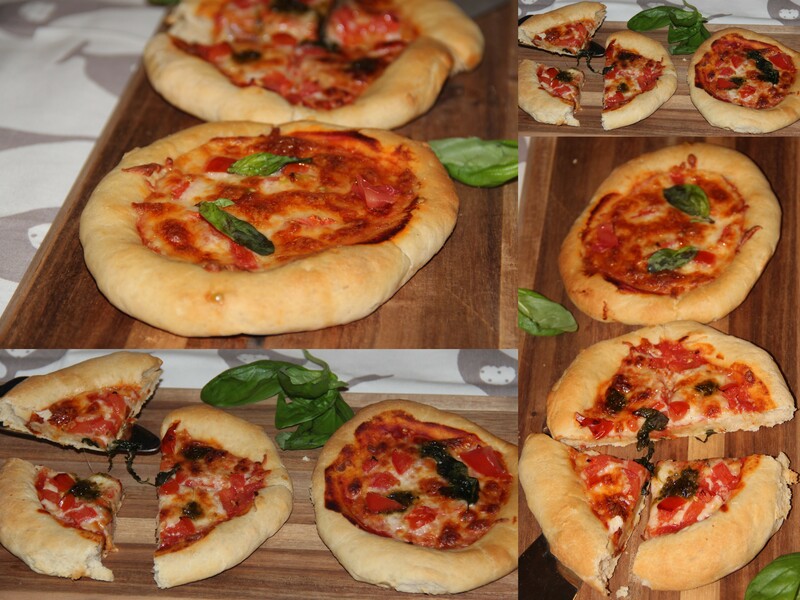 I did two small pizzas as I was baking this for my daughter, so the size and thickness can be personalised. Posted on November 14, 2014, in Breakfast, International, Kids recipes, Main Course. Bookmark the permalink. 17 Comments. Our family loves homemade pizza night. These looks perfect for kids. Pizza’s one of my favourite food. I never tire of eating it. I love the pairing of basil and tomato – so yummy together. Adorable little pizza’s and pizza margherita is my favorite.